What happens when you put rectangles of paneer through your food processor with the shredder blade on? You end up with soft piles of stringy tendrils of paneer. What happens when you saute soft piles of stringy tendrils of paneer? It becomes soft and gooey creamy cheesy deliciousness. That then gets eaten quickly. Update: I didn’t originally share a recipe for this…I thought I could get away without one like Jennifer from Last Night’s Dinner. But a few people have asked, and I feel bad not sharing. I’ve only made this once, and it was a bit on the fly but here’s the recipe from memory. Cut the paneer into small inch long sticks that will fit through the food processor. Fit your food processor with the shredder blade and shred the paneer. You can do this by hand with a grater but it will probably take forever. If you don’t have a food processor, try letting the paneer come to room temperature then crumbling it by hand. In a wide skillet, heat about a tablespoon of oil. Add the onions and cook on medium heat until glassy, about 5-8 minutes. Add the tomato and cook until the tomatoes melt, about another 5-8 minutes. Add the peas and cook until softened. Stir in the paneer and all of the spices. Stir in the milk and cook for another 2-3 minutes. Variations: Try substituting mushrooms or crunchy corn for the peas then spreading the paneer mixture on crunchy triangles of toast with a hot cup of tea. This looks SO tempting! It’s such a co-incidence – I just posted a Paneer recipe on my blog too. Lovinngg the pics on your blog. Definitely one I’m going to visit more often! This paneer dish looks delicious! I just found your website which happily coincides with my interest and foray into Indian cooking. I live in the southwest and we thankfully have one international market where I can find things like asafetida and besan flour. I have a question though-what is “lal mirch”? a spice? And also, I tried making pooris (puris?) and although several of them had giant puffed up bubbles, they were still flat, except for one that was actually saucer shaped. Is it a question of having really, super hot oil or an issue with the dough? (I used besan, vegetable oil and a pinch of salt). @Gwen – That’s great that you found an international market. Having the right ingredients for Indian cooking are half of the battle. Lal Mirch literally translates into Red Chili. It’s red chili powder, which is like cayenne pepper. As for your second question, I’m no puri expert but I did consult with my mom and dad. Unfortunately all that I learned is that a number of things can contribute to puris having puffed up bubbles but still being flat. This happens if the oil isn’t hot enough and if the consistency of the dough is off. The ingredients in your puri though sound right! Good luck with your venture into Indian cooking. Keep me posted! Is there an actual recipe for this somewhere? I can’t see it…. and I’m dying to make it because it looks so good! @MK – Ok so you’re the first to notice I cheated and didn’t include a recipe! I made this on the fly so the recipe isn’t tested and true but I’ll add it up above so you can give it a shot. With melty paneer, I don’t think you can go wrong. By the way, as a food blogger, you might want to attend this year’s International Food Blogger Conference in Seattle on August 27-29. It will sure be a great experience from you and you’ll learn a lot from the speakers. You can find more info here. 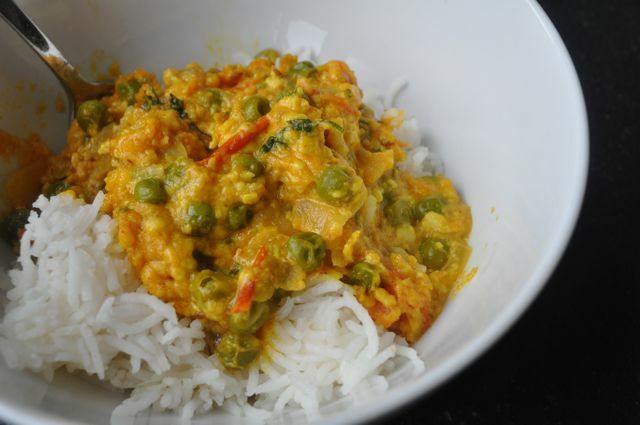 Delicious and tempting curry, looks all tasty!